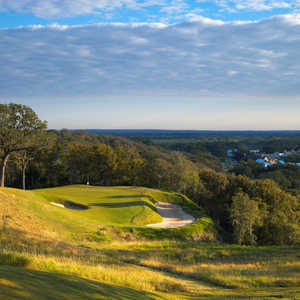 BASTROP, TX -- What's the best golf course in Bastrop that you probably have never heard of? Make a note of it -- Pine Forest Golf Club. 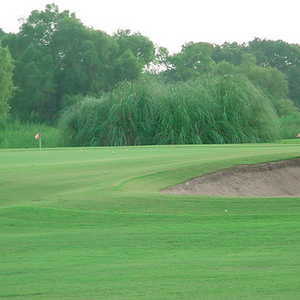 Designed by tall Texan Don January and Billy Martindale in 1979, this course has received Golf Digest's 3-star rating for two successive years. 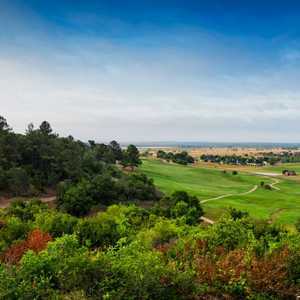 At 6,569 yards and par 72, its too short to be considered a genuine championship course, and it has recently lived in the shadow of nearby ColoVista Country Club, which has stole all the publicity for this neck of the Lost Pines woods since it opened in 1997. But folks, with a little hard work on conditioning, this target-test layout could steal the thunder of ColoVista. Pine Forest Golf Club is an adventure through red cliffs, major elevation changes, three blind tee shots, three sensational downhill par-three holes and several scenic holes which are played right on the banks of the Colorado River. Other holes bend blindly around red-dirt bluffs and through pines, pecans, oaks draped in Spanish moss, cedars, wild grapevines and pampas grass. The unique area around Bastrop is steeped in Texas history. In the mid-1800s, the Lost Pine Forest, the westernmost stand of the eastern pines and the only timber available in what was then western Texas, contributed greatly to the local economy. In 1839, when Austin became the capital of the Republic of Texas, Bastrop began supplying the city with lumber. Soon, ox teams were delivering Bastrop lumber to San Antonio, along the western frontier and into Mexico. Historic downtown Bastrop has been restored and attracts vacation travelers from all over the world. And great golf makes this city a must-do links experience when you visit Central Texas. "This is one of my favorites," said Jim Williams. "It is sneaky hard. It's not particularly long or narrow, but it requires lots of precise approach shots. If your short to middle irons are off you better watch out! I've played the course five times over a three-year period. The condition of the course has been good or slightly better, but not excellent. But for the price, this is one of the best around." Oh yeah, the price. For such a unique, scenic, fun layout, Pine Forest is a steal. For $25 from Monday to Thursday, which includes a shared cart, you won't find a better bargain anywhere for such an excellent layout. And how about the conditioning? "We are constantly trying to improve the course," said Tom Belobraydic, Director of Golf, "and right now we are renovating and expanding the clubhouse." No. 3 is the signature hole. This 170-yard par-three is a picture postcard. It's downhill and a red cliff frames the landscape in back. On the short, but tricky 350-yard dogleg left par-4 sixth hole you have to find the right side of the fairway to keep from having a blind second over a cliff. The two-tiered green slopes to the Colorado and is a tough two-putt. When you arrive at the par-three 7th, a 200-yarder on the banks of the river, you have to stop and enjoy the scenery, with a huge cottonwood on your left. A forced carry of 170 yards over water deep below you in a ravine faces you on the 350-yard, par-4 No. 11, which doglegs left. Once you reach the green you are at the highest point of the golf course, and you are treated with a panoramic vista. And that includes No. 12, another straight downhill par-3. It's 180 yards with a green that slopes severely from front to back. Leave it under the hole or face the indignation of a three-putt. The final downhill par-3 challenge is at 16. It's 225 from the back and a huge oak tree protects the left. The wind can be deceptive above tree-line and there's no-man's land too far right. So needless to say, when you come to Bastrop to play ColoVista, don't forget this hidden gem. You might like it better than ColoVista. Green Fees: Monday to Thursday, $25, Seniors $22 (50+), Twilight after 2 p.m., $18. Sunrise special before 8 a.m., $20. Friday: $35. Seniors $30. Twilight $20. Sunrise special $20. Saturday, Sunday and Holidays: $40. Seniors $35. Twilight $25. Sunrise special $35. Green fees include shared cart.